Astronomers have found a way to harness clouds of gas in space to make a natural 'telescope' more powerful than any manmade telescope currently in operation. And they will use it to peer closer to the edges of black holes than anyone's ever seen before. The phenomenon underlying the technique is confirmed in a recent paper in the Astrophysical Journal by a team from the Australian research institution CSIRO, the University of Adelaide, and institutions in The Netherlands. The paper is based on observations by PhD student Ms Hayley Bignall (now at the Joint Institute for VLBI in Europe), made with the CSIRO Australia Telescope Compact Array radio telescope in eastern Australia. "That's a hundred times finer detail than we can see with any other current technique in astronomy," says Ms Bignall. "It's ten thousand times better than the Hubble Space Telescope can do." "And it's as powerful as any proposed future space-based optical and X-ray telescopes." Armed with the new technique, astronomers hope to learn a great deal more about how giant black holes make 'jets' of super-hot charged particles and spit them millions of light-years into space. "We'll be able to see to within a third of a light-year of the base of one of these jets," says CSIRO's Dr David Jauncey. "That's the 'business end' where the jet is made." The researchers hope gather basic data such as the size of a jet at its base, the pattern of magnetic fields there, and how a jet evolves over time. They are particularly interested in the black holes in quasars. These are the super-bright cores of distant galaxies. The new technique uses the same phenomenon that makes stars twinkle - atmospheric turbulence. Our Galaxy has an invisible 'atmosphere' - a thin gas of electrically charged particles that fills the space between the stars. Lumpiness in this gas can act like a set of lenses, focusing and defocusing radio waves from distant objects, making them appear to strengthen and weaken. This variation is twinkling or 'scintillation'. Objects twinkle only if they look very small on the sky. Quasars are small enough, so distant that they are mere points of light. Quasars twinkle more slowly than stars. Any change in less than a day is considered to be fast. The fastest scintillators have signals that double or treble in strength in less than an hour. 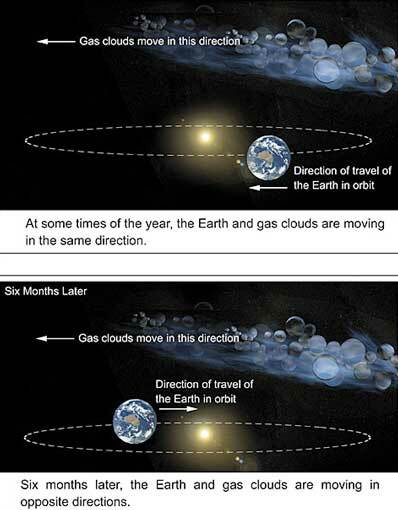 How fast and how strongly the radio signals vary depends on the size and shape of the radio source, the size and structure of the gas clouds, the Earth's speed and direction as it travels around the Sun, and the speed and direction in which the gas clouds are travelling. The researchers have shown that by observing how the variability of the radio signal changes over the course of a year, they can build up a two-dimensional picture of the radio-emitting regions of a quasar. The technique, dubbed 'Earth-Orbit Synthesis', was first outlined by Dr Jean-Pierre Macquart of the University of Groningen and Dr David Jauncey of CSIRO, in a paper published last year. The Bignall et al. paper focuses on a rapidly varying quasar called PKS 1257-326, which lies 4 million light-years from Earth. Ms Bignall found that it shows an annual cycle in its pattern of scintillation. This had previously been seen in two other quasars, J1819+3845 and B 0917+624. But PKS1257-326 is also the first quasar to show a time delay between the variability recorded at the two frequencies studied (4.8 and 8.6 GHz). "This is almost certainly because there is a displacement between the emission at the two frequencies. 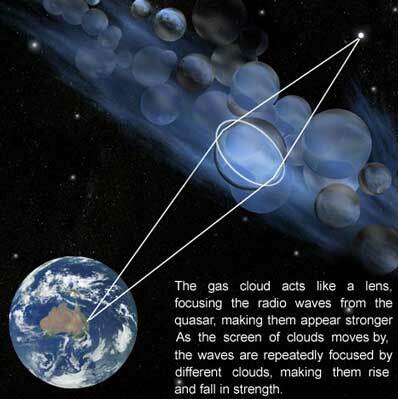 At the higher frequency we are looking further down the throat of the radio jet," says Dr Macquart. "In angular terms, the offset is about ten microarcseconds. We are mapping source structure with microarcsecond resolution. We can even look for changes as matter strays near the black hole and is spat out along the jets, " he says. The signals from PKS1257-326 vary in strength by up to 40% in as little as 45 minutes. That means that the turbulent gas scattering the signal lies quite close to Earth - only about 50 light-years away. An extensive survey for other fast scintillating quasars has turned up very few. "This suggests that there aren't many of these 'scattering screens' nearby in the Galaxy," says CSIRO's Dr Jim Lovell, a member of the research team who is also doing a major new search for fast scintillators.